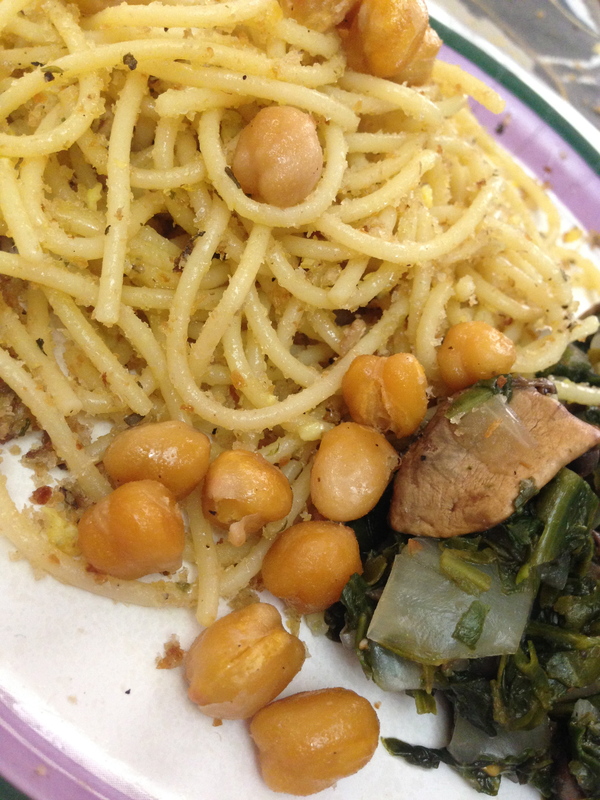 We served this with sides of roasted chickpeas and onions/spinach/mushrooms sautéed with a little olive oil. If you scream OH NO! (or words to that affect) at least TWICE during your meal prep than maaaaaaybe you should rethink using that recipe. Dear New York Times Recipes: I SHAKE MY FIST AT YOU. The _second_ time I needed to grab the broom to clean up from the spray of breadcrumbs that I managed to get EVERYWHERE I nearly gave up. In today’s NY Times there was a whole section (Section D) discussing artisanal bread makers – one of whom we know (and ADORE his breads!). Our business – Little Bird Chocolates – operates out of a Kitchen Incubator/Shared Commercial Kitchen in Queens, NY. One of the other businesses in the kitchen (called The Entrepreneur Space) is Nordic Breads – and they were WRITTEN UP IN THE NEW YORK TIMES! Breadcrumbs? Check. 2 Egg Yolks? Check. Pasta? Garlic? Fish Sauce? Anchovies….okay. I have Sardines. That’ll totally work. So I started the recipe. You get a big fat pot of water boiling for your pasta. When the pasta is done – SAVE 1/2C of the pasta water, then drain the rest of the pot. In a second pan you heat up some oil, toss in your tinned fish, a heap of garlic, some ground red pepper (if using) and mash everything together. Then you toss in a cup of good breadcrumbs, a few cranks of black pepper, a dash of salt, and lower the heat. You stir everything to coat and leave it alone to get all nice and toasty brown. In a bowl you combine the egg yolks, fish sauce and 2T of starchy pasta water. You add in the pasta and stir to coat. Then you add in the breadcrumb mix and stir to coat. Oh, and parsley too. Which I forgot. smh. Then you drizzle with more oil and serve. Now, if you are SMART, you’ll save the pasta water. If you are SMART, you’ll not get breadcrumbs all over the floor. If you are SMART, you won’t let the egg yolks actually cook on the pasta – creating a clumpy mess instead of the supposed silky sauce. If you are SMART, you won’t yell inappropriate words within earshot of twin toddlers. I attempted to fix the pasta by adding more oil to the pot, but it was still really dry. It was not the silky sauce I wanted to serve. 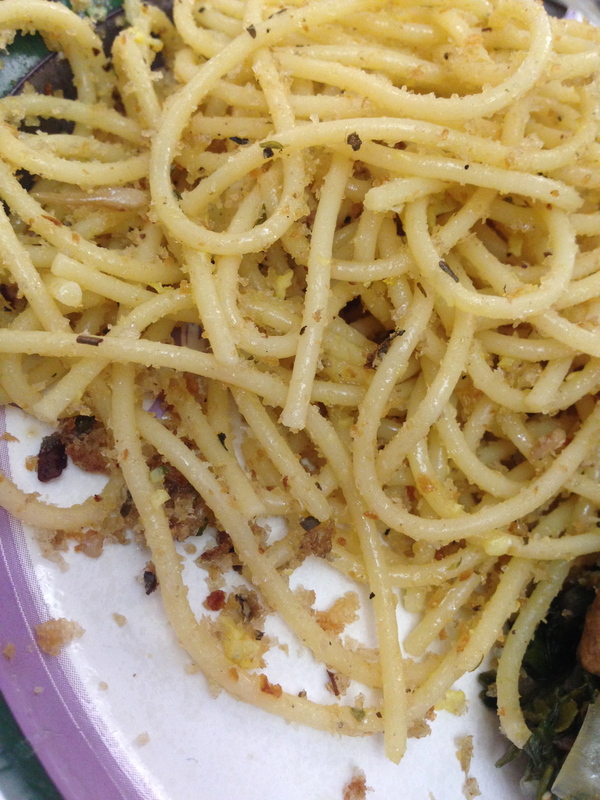 HOWEVER, the crunch of the breadcrumbs, the garlic, the fish – it was all really nice. 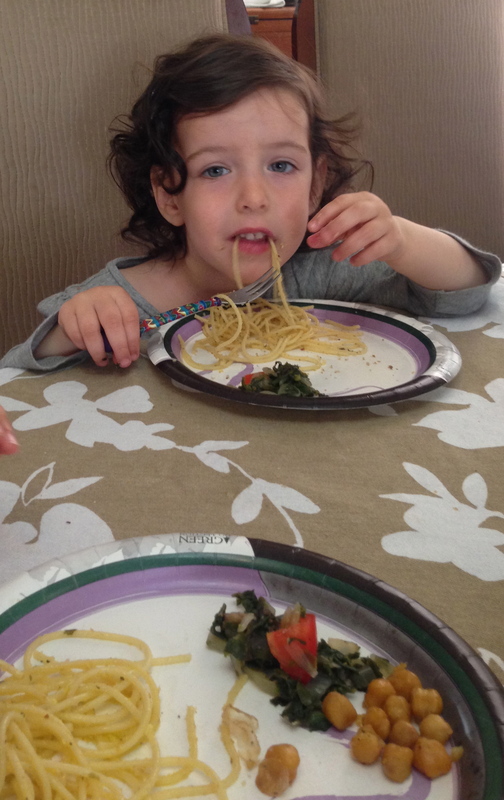 The sardines totally did NOT overwhelm the pasta like C thought it might. 1 cup good dried bread crumbs **3 handfuls is 1 cup, right? 1/2 cup roughly chopped parsley **sigh. I forgot to add. Lemon wedges, for serving **I tried adding in a touch of juice to my plate. Didn’t taste right to me. 1- In a medium skillet over medium-high heat, warm oil. Add anchovies, garlic and red pepper flakes; cook until fragrant, 1 minute. Stir in bread crumbs and cook until golden, 2 to 3 minutes. Season liberally with black pepper, and a little salt if needed. 2- Bring a large pot of salted water to a boil. Add spaghetti and cook according to package instructions; drain well, reserving some of the pasta water (about 1/2 cup is plenty). 3- In a large, preferably warmed bowl, stir together egg yolks, fish sauce, hot sauce and 2 tablespoons pasta water. Add hot pasta and toss well, adding more pasta water if the mixture looks dry or unevenly yellow. You want the yolk to evenly coat the pasta but you don’t want it to be soupy. Add bread crumb mixture and parsley and toss well. Season with plenty of black pepper, and salt to taste. Drizzle pasta with more oil just before serving and serve with lemon wedges. Even though it/I made a big mess, we enjoyed the meal. I might even attempt it again. It really was super easy to make.